ITP Travel UK's headquarters are close to the stunningly beautiful Windsor Castle, and easy access is available via train, car and plane. We are always happy to hear from you. Below you will find a variety of methods in which you are able to contact us, or please use the quick enquiry form at the bottom of the page. There is a large public car park at the end of the Alma Road, beyond the railway line and near the river Thames (see map). 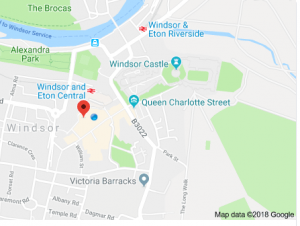 The nearest rail stations are Windsor & Eton Central and Windsor & Eton Riverside. The car park and stations are 5 minutes walk from the office. The nearest airport is London Heathrow (LHR), 11km away.